More like the path to nowhere. It did feel a lot like wheel-spinning (and/or rickshaw-pulling), and the sequence with David concocting his battle plan led me to assume that we were going to get the "pieces" all moved into place by the end of the episode, but that did not quite come to pass. We have three episodes left, so I guess there's going to be another episode's worth of getting things into position, and then maybe a full two hour climax and denouement. I'm not certain I entirely understood the direct in-episode significance of the Black Mirror-esque retelling of the Allegory of the Cave. Perhaps it's meant as a metaphor for Fukiyama (and now Ptonomy) being stuck inside the mainframe, and only able to sense and interact with the outside world through the android intermediaries. I'm hoping we can pull it together, because there are still so many great moments. But our treatment of marginalized characters just keeps ramping up. Like, why is Clark sleeping alone? Where did his husband and kid go? We get Melanie back just to have her controlled by the Shadow King? I was struck by how trapped the women are. Lenny is trapped in Amy's body. Amy's mind is trapped in the Shadow King, or fractured between both. Melanie is trapped by Oliver. And Clark reminds Syd that her boyfriend could destroy reality if his feelings were hurt really bad. And I'm not sure if our creator considers that to be an understanding of how coercive that power dynamic will always be, or generic Man Pain. That said, I was impressed that they managed to pick a poem that I actually recognized. I have never considered myself to be particularly literary, so I'm sure other people would find it cliche. AVClub wrote about how these voiceover 'lessons' are getting old. I agree, except in that I think they were old from the start. It's not a good storytelling device and it reminds me of why I didn't like the most recent season of Fargo - it's beating the viewer over the head with extremely basic philosophical concepts that are not new or interesting, and in this case we should be able to recognize these things in the show narrative itself without a jarring 'tutorial'. Ugh. This show is so infuriating. Sometimes it'll be utterly bonkers and intense and poignant within a single scene... and then you get a 4 minute music montage clearly designed to fill time. I get it, you're really good with After Effects Legion editing crew. 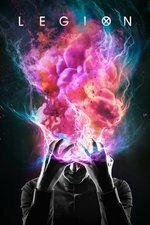 I love Legion, it feels like a special gift from my own subconscious in that it ticks so many boxes for me, but this episode was pretty inessential. I liked the Jon Hamm voiceover lessons at the start—the first one with the ticcing cheerleaders was excellent—but one a few episodes ago was so clunky and devoid of style or wit that I've soured on them. Especially since they were all about the delusion chick, and now that the delusion chick has been dispatched, I wasn't expecting them to start anew. And this episode, like many others and television in general, had not enough Bill Irwin. Am I wrong or did this episode contain the first mention of Professor X, by the aging woman being interrogated by the Shadow King? I’m definitely on board the Jon Hamm voiceover thing is not great. It sounds like things dudes say at parties to sound smart. I need to go back and watch S01 when this is all done, because I don't remember how explicitly they identified Xavier as David's father, but IIRC this is the closest a character has come to literally saying his name out loud, i.e. "The Professor". I'm perfectly fine with keeping Legion as its own quirky offshoot of some unspecified mix of the comics and film universes, but I wonder if the woman's age could be an indication that the show exists roughly in the timeframe of last year's Logan, where the Xavier School has been destroyed and Xavier is either in hiding or dead. I notice they've developed the Pink Floyd quote to In The Flesh from The Wall. "When does a dream begin?" This show is bonkers. I love everything about it and somehow I don't care that I don't "understand" it in any normal sense of the word. It's magical. The college dorm philosophizing didn't bother me until this episode, where it jarred me waaaaaay out of the mood of the slow build-up of David's pieces being put into place. It was so 2018 in a season that has seemed "out of time". Syd's necklace in the tent was not the hexagonal compass, but the compass was around the neck of the skeleton. Tents are not quiet in a wind storm.